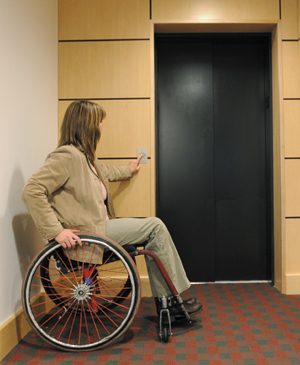 Your Elvoron LULA Elevator will be a key feature of your building. Interior design and finish are important considerations. We offer a variety of attractive and durable wall and ceiling finishes as shown below. All Elvoron cars are supplied with basic plywood floors ready for installation of your preferred flooring material, as supplied by others. Car Wall Laminate Panel Selection - Fire rated, tough and easy to clean. Offered in a choice of 6 colors. Like a commercial elevator, the Elvoron LULA Elevator is equipped with two-speed horizontal sliding entrance and car doors. The car doors are finished to match your car wall trim and are equipped with full height photo-electric door sensors. The hall doors are primed and ready to be painted to match your building decor. All doors can also be supplied in brushed stainless steel. Elvoron LULA Elevator car interiors can be customized to whatever unique design best suits your building project. Our custom shop offers a wide variety of wall, ceiling and fixture finishes. We can also build elegant stainless steel and glass cars. The trim separates the car wall panels and adds the finishing touch to your elevator cab. The standard trim is available in black or white. Custom colors and stainless steel finish trims are available as an option. All Elvoron LULA's are equipped with four recessed low-voltage L.E.D. lamps that illuminate automatically when the doors open. Ceiling choices are white, stainless steel or custom. White lamps are fitted into white ceilings, black into stainless ceilings. Chrome lamps are optional. All Elvoron cars are equipped with one handrail on the control wall. Additional handrails can be mounted on the other car walls for extra passenger security.